We’d love your help. Let us know what’s wrong with this preview of A Season to Wed by Cindy Kirk. Ten years after what she thought was her almost-wedding, Hope Prentiss discovers that the c They’ve helped orchestrate the perfect day for countless couples. Now twelve new couples will find themselves in the wedding spotlight in the second Year of Weddings novella collection. Ginger Winters will be the “beauty-maker” for the Alabama society wedding of the decade. But when high-school crush Tom Wells shows up looking for a haircut, Ginger’s thinly veiled insecurities threaten to keep her from love once again . . . despite Tom’s best efforts. Meadow knows how to serve delicious food to match any wedding theme. But can she accept love when it's served up on a silver platter? Meadow Larson is having the mother of all Mondays when her roof caves in during a blizzard, right before the most important wedding contract of her career. Renovation contractor Colin McGrath offers to fix Meadow’s roof, even though he knows he is the last person she would accept help from. To ask other readers questions about A Season to Wed, please sign up. If you like wintry weddings… if you like stories that revolve around the people who make weddings possible … if you like sweet and sometimes sassy romance, A Season to Wed is a great novella collection for you! All three authors – Cindy Kirk, Rachel Hauck, and Cheryl Wyatt – vividly bring their characters and settings to life, and each story points unequivocally to the Author who IS the very definition of Love. A perfect way to spend a chilly Spring evening! Love at Mistletoe Inn by Cindy Kirk - If you like wintry weddings… if you like stories that revolve around the people who make weddings possible … if you like sweet and sometimes sassy romance, A Season to Wed is a great novella collection for you! All three authors – Cindy Kirk, Rachel Hauck, and Cheryl Wyatt – vividly bring their characters and settings to life, and each story points unequivocally to the Author who IS the very definition of Love. A perfect way to spend a chilly Spring evening! Love at Mistletoe Inn by Cindy Kirk - I was drawn to the brewing sub-plot romance between Amity and Dan – surprisingly even more than to the main characters Hope and John. In fact, I would be first in line to read a story with Amity & Dan as the MCs :) I also loved Verna and her Mistletoe Inn shenanigans, though that did take some suspension of disbelief. For the most part, I enjoyed the story -it's cute and sweet! However, I had trouble understanding some character motivation - particularly the motivation behind some of Hope's actions and reactions. A Brush With Love by Rachel Hauck is full of wit, grins, and southern sass but it’s also just such a heartfelt, moving, and beautiful picture of God’s love for us – and of true romance. Tom’s mission to help Ginger see her beauty, despite her scars, truly touched me. His execution of said mission brought tears to my eyes more than once. The epilogue – well – just make sure you have a tissue box handy but your smile will be firmly in place as well! Serving Up A Sweetheart introduced me to Cheryl Wyatt and made me want to hunt down her backlist and catch up! From the moment Colin encounters Meadow trying to assassinate a snowman, I knew I was going to like these two characters – separately and together – and I did! I loved the humor, the sweetness, and the theme of restoration (spiritual, relational, and literal). This novella also contained such a great line – “Colin cradled her gaze intently in an effort to anchor his answer therein…” Oh, don’t you just love that phrase – “cradled her gaze” ? Love at Mistletoe Inn by Cindy Kirk - In my opinion, there are so many ways this novella could have gone and would have been better if the story had been done differently. The premise of the story - two kids go to get married right out of high school but she has doubts and backs out before they even leave the building but not before they've gone through the ceremony and signed the paper. Now, 10 years later, they find out that they are still legally married. Hope and John have had limited con Love at Mistletoe Inn by Cindy Kirk - In my opinion, there are so many ways this novella could have gone and would have been better if the story had been done differently. The premise of the story - two kids go to get married right out of high school but she has doubts and backs out before they even leave the building but not before they've gone through the ceremony and signed the paper. Now, 10 years later, they find out that they are still legally married. Hope and John have had limited contact over the last 10 years but then John decides to move back to Harmony and settle down. Once Hope finds out about the marriage still being legal she goes to John to tell him about it. What happens next totally threw this book out the window for me. Rather than enhance the romance of the book I think it spoiled it. And even though I liked the character of Aunt Verna, the whole ruse of planning a wedding for two people who were "deployed" was over the top. And the fact that John and Hope were dense enough to believe it was somewhat frustrating. A Brush With Love by Rachel Hauck - Ginger is a very talented and accomplished hair dresser who has worked for the stars. She's moved back to her home and is successfully running a beauty shop in town. But Ginger was scarred by a fire when she was a young girl and sees herself as ugly. She covers her scars with long sleeves and scarfs and secretly longs to be normal. She's hired to style a wedding party and finds out that the best man is none other than the guy who stood her up when his family mysteriously left town 12 years ago. Ginger should have put it past her, but she couldn't get over the hurt and rejection of the only guy who has ever paid her any attention. Tom is back in his hometown to start a church. Due to the way they left he must work to overcome town bias against his family. He must also work to overcome the walls surrounding Ginger’s heart. Tom sees Ginger’s inner and outer beauty but will he be able to convince her of his love and that both he and God find her beautiful? Serving Up A Sweetheart by Cheryl Wyatt - Meadow Larson has triumphed over the trauma of her childhood to become a talented wedding caterer and decorator. When her roof caves in during a blizzard, right before the most important wedding contract of her career, she's in a panic. When Colin McGrath, renovation contractor and an unwelcome connection to her past, sees her trying to take out a snowman, he knows he has to help her. Even if he's the last person she would accept help from. I loved this sweet romance! Meadow has a hard time believing that Colin is not the same person she knew as a teenager. Even though she has moved on from her painful childhood thanks to her grandmother, Meadow has not fully released all of the hurt and anger from her past. When Colin returns to town to help his parents, he stirs up all the old feelings. But Colin is determined to show her that he has become a Christian and has changed. I loved how sweet and patient he is with Meadow. With bits of humor, moments of chemistry, and uplifting faith, you'll be hooked to the last word. In this novella a wonderful, single, elderly woman named Verna has in her heart adopted two people, Hope and John. Verna is my favorite character because of her love, no nonsense yet gentle approach and giving heart. In the tale two, young, impulsive teenagers make an adult decision to marry in a different state now meet again for the first time in ten years. Prior to this, Hope ran out of the chapel no longer wanting to be married and John left town. Now they reunite in a tale of redemption, forgiveness, love and faith. I cannot help but think this novella will touch the very heart of any reader who is willing to open their heart to the Story behind this story. The main female lead is a woman named Ginger who suffered a tragedy as a young preteen and has lived with the outcome both within her heart and outside with scars. Here is a parable of sorts that I believe will help others understand God in a new way and be willing to reveal to Him the scars of their hearts. The novella portrays pastors as humans who sometimes make mistakes just like the congregation in the pews. Hope is what you might feel when the story ends, but what just might be beginning in your heart. Meadow is a caterer and decorator extraordinaire! Her past hurts and trials God has turned into a budding business born through her heart’s desire. Meadow’s home life and school bullying experiences colored her view of Conner when he returned to their hometown. Conner’s past wasn’t something he was proud of, but God had really changed him if only he could convince Meadow of that truth. This is a wonderful tale of love, forgiveness, earning back trust and letting go of past hurts and those who caused them! Three sweet stories of those who help create perfect weddings finding love of their own. 'Love at Mistletoe Inn' begins with an intriguing premise: a young couple who thought they had called off their wedding learn that they were indeed legally married. This sets up all kinds of possibilities! Unfortunately, I found these characters hard to relate to, and their actions and decisions awkward. It was a cute story that will likely appeal more to some, but it was my least favorite of the set. 'A Brush Three sweet stories of those who help create perfect weddings finding love of their own. 'A Brush with Love' tells the beautiful story of Ginger, who sees the beauty in others but not in herself. So many women struggle with self-image issues, and the encouragement wrapped up in Ginger’s story is sure to encourage others who have felt the same way. She faces a number of challenges throughout the story, but the hero of her story turns out to be truly that! 'Serving Up a Sweetheart' begins with Meadow’s world literally crashing down around her. As she works to honor her commitments and keep everything going, she has to accept help from a former rival. Like Ginger, Meadow has self-image issues to resolve, but with the right help, she begins to see the truth about who she really is. Another encouraging story for those who have been in similar situations! I received a copy of this book for my honest review. A wonderful collection of stories by three very talented writers. Rachel Hauck, Cindy Kirk and Cheryl Wyatt all spin a wonderful love story for you to read and enjoy. All three storied with different sets of circumstances will have you glued to you seat as you devour this most wonderful book. Be sure to order your copy today. 4 stars! Three VERY good, sweet romantic stories full of faith, love, and forgiveness. Make sure to have tissues handy. You will need them. First, there is the wedding that wasn't legal, or was it? Ten years later, Hope and John find out the truth of their young romance. A beautiful story with lots of heart. Next, there is the story of Ginger. She is scarred inside and out by a fire at age twelve. She overcomes it to become a successful "beauty maker" and salon owner when her high-school crush comes back Three VERY good, sweet romantic stories full of faith, love, and forgiveness. Make sure to have tissues handy. You will need them. Next, there is the story of Ginger. She is scarred inside and out by a fire at age twelve. She overcomes it to become a successful "beauty maker" and salon owner when her high-school crush comes back to town. His family scarred by scandal. Their story is so sweet and tender. As she is the stylist for the wedding party of (one of the snootiest girls I've read) a former classmate and Tom is the best man. I received this book from a contest at Goodreads. I can definitely recommend all three stories in this book. They are all good, clean stories with the theme of forgiveness in all of them. Love at Mistletoe Inn by Cindy Kirk has Hope Prentiss discovering her wedding of 10 years ago is valid. Then the "groom", John Burke, returns to town, and Cindy helps him plan a Christmas wedding. While they are working together, she begins to wonder if their marriage should be dissolved. A Brush with Love by Ra I received this book from a contest at Goodreads. I can definitely recommend all three stories in this book. They are all good, clean stories with the theme of forgiveness in all of them. A Brush with Love by Rachael Hauck has Ginger Winters the "beauty-maker" to Alabama society. She was scarred inside and out when she was a child. Her high school crush, Tom Wells, comes back to town to attend a wedding that Ginger is helping to do. Can they both over come her scars to move on with life? The first story was the worst: the set-up was just implausible, and then the weird consummation? (We don't want to be married and haven't seen one another in years, but let's fall into bed now so that we can't simply have the marriage annulled!) And a charming family member is actually plotting a whole wedding for you without your permission? NO. THANK. YOU. I had higher hopes for the second story, as I've actually enjoyed several of Hauck's books. Nope, this was pretty silly, too. "Just believe you're beautiful, and God will make everything hunky dory." I liked this story. It was a self reflection. There was a lot more to it than just on old passion coming back to life. “A Brush With Love” was a story about a lady named Ginger, and she had a visitor come to her beauty shop for a haircut. He was the first love of her life. It opened up many doors she thought she had closed and barred. This was a very clean story for older teens onward.. I won this book through a Goodreads First Reads giveaway. Somehow I missed the part about these being Christian Fiction when I entered the giveaway. I don't usually like Christian Fiction because I find it a bit preachy. I read all of Love at Mistletoe Inn by Cindy Kirk and actually enjoyed it, but I couldn't get into the other two Stories. Hope has sworn off love ever since her quick marriage that ended almost as soon as it happened or so she thought. While she is with her friend at a Boise Bridal Extravaganza, she finds out that even though her marriage was never recorded she still could be married. Her ex, John, left town after their “failed” marriage and graduation but has decided to return and put down roots. I thought the writing style was enjoyable and never felt that it dragged. I did really enjoy this book, but I thought there was too much mention of the attraction of both characters and adult situations for a Christian story. It did not go into any descriptions, but I really would have preferred for that not to be there. It just seemed too sudden. I would read more from Cindy because I did like her writing but would do so after some research on the book. Ginger tries to make others beautiful through styling hair. She was in an accident where fire has left her physically and emotionally scarred but that is not the only thing she can’t get over, Tom Wells. Ginger tutored Tom in high school and even was going to go on a date with him, but he didn’t show up or give or a reason why. Ginger is not the only one with something to hide, Tom left town for a reason and does not want Ginger to know. However, it’s going to be hard for him to hide it, especially since he came back to town to start his own ministry. Tom’s old feelings have started to resurface and spends some time with Ginger because she is doing the hair for his friend’s wedding, at which is going to be part of the wedding. I probably liked this story the most, but Serving Up a Sweetheart was really close. I hated to see how the bride treated Ginger. Bridget didn’t really give much thought in how her actions made Ginger feel. This story definitely had God has a focus more so than the other books. I liked seeing that Ginger wasn’t a believer at first because the stories I’ve read in the Year of Weddings series has had both of the main characters already have faith. However, keep in mind I have not read a lot of these. I just found it refreshing. I have read another book by Rachel Hauck before and would do so again. Meadow cannot catch a break first her ceiling collapses, see attacks a snowman, and one of her high school bullies/tormenters sees her fight a snowman and lose, well at least her shoe inside of the snowman. Colin offers to help her but does not recognize who it is at first. He apologizes but Meadow doubts his sincerity. Colin offers to fix Meadow’s kitchen that she has been using for catering, and she eventually agrees after Colin mentions that she could pay him back by doing some decorating for him. Also, he lets her use his pole barn kitchen to work in while he is working on her kitchen. I thought the beginning of this story was pretty funny, especially the snowman scene. I loved that Meadow’s catering team consisted of at-risk teenagers. In my opinion, it was a very nice touch. God is mentioned a bit throughout, and I felt that praying/talking to God was done more in this story than the others. I don’t think I’ve read anything by Cheryl before and definitely would, especially any that had quit a few comedic moments because I thought those were pretty great. Overall, I think this book as a whole mentioned God more than the other Year of Weddings more than Winter Brides and thought that was definitely important to note. Rachel Hauck, Cindy Kirk and Cheryl Wyatt in their new book “A Season to Wed” Book One in the Year Of Weddings Novella Collection series published by Zondervan takes us into the lives of Hope Prentiss, Ginger Winters and Meadow Larson. From The Back Cover: They’ve helped orchestrate the perfect day for countless couples. Now twelve new couples will find themselves in the wedding spotlight in the second Year of Weddings novella collection. Sometimes the road to ha Rachel Hauck, Cindy Kirk and Cheryl Wyatt in their new book “A Season to Wed” Book One in the Year Of Weddings Novella Collection series published by Zondervan takes us into the lives of Hope Prentiss, Ginger Winters and Meadow Larson. This book is the first collection of the individual Weddings Novella stories that Zondervan published. Let me start off by saying that each of these stories is very clever and all are a lot of fun. Cindy Kirk starts us off with Hope, who is a Wedding Planner, and she faces a number of surprises, not just in the planning but in her personal life as well. Then Rachel Hauck gives us Ginger, who is an insecure “beauty-maker”, who if she is ever going to receive love must come to grips with these insecurities. Finally Cheryl Wyatt gives us Meadow who is a wedding caterer whose roof caves in. She gets more than just a new kitchen. Each one of these stories provides us with wonderful characters that live and breathe on the pages and whom we rally behind them and root and cheer for them to succeed. “A Season to Wed” collects three marvelous stories that are truly great romances. This book does not disappoint at all. I enjoyed it and I am already looking forward to the next Novella Collection. Wrong edition . It was really large print and I couldn't change it! Pretty good liked the last one best. Liked the last one best by Cheryl Wyatt.. cute story about catering. Rachel second favorite about scars you can see and ones you can't. I love books like this where you get the chance to read different authors.The book was a treat to read and I found each story to be very well written. In Love At Mistletoe Inn by Cindy Kirk we are introduced to Hope and John. They were young and so in love, How many remember your real first love? You didn't think you could live without. It didn't seem to bother Hope and John that they were young as they said I do that day. After all the papers were never sent off to be legalized. so they walked a I love books like this where you get the chance to read different authors.The book was a treat to read and I found each story to be very well written. In Love At Mistletoe Inn by Cindy Kirk we are introduced to Hope and John. They were young and so in love, How many remember your real first love? You didn't think you could live without. It didn't seem to bother Hope and John that they were young as they said I do that day. After all the papers were never sent off to be legalized. so they walked away thinking it was all just for fun. Ten years later Hope and John run into each other. What will happen when they discover they are still legally married? Can this couple find the spark they once had? It is a nice story of forgiveness and finding true love. A Brush With Love by Rachel Hauck is a moving story about Ginger Winters. As a child she went through a tragic accident that left her with scars both physically and emotionally, So many of us carry those hidden scars which stops us from finding happiness. We begin to hide from the world because we think no one can stand to look at us. I loved how the author tells a beautiful story of a young woman who discovers that people can see past scars to the beauty that is inside. Can emotional scars hold us back from living with confidence. This story will bring tears to your eyes as Ginger tries to reconnect to an old boyfriend. Will she find peace ? Serving up a Sweetheart by Cheryl Wyatt is another great addition to this book . Meadow Larson was teased in school and those painful memories still haunt her today. Have you ever been bullied? Can hurtful words ever be forgotten? Meadow's life at home was not much better. Living in an abusive home as a child left many scars for Meadow., I found that the author wrote a very touching story and showed readers how words really can hurt you. When Meadow runs into Colin, a classmate from school she is not quite sure she can trust him. Will Meadow find a way to forgive? It was a book that I found to have valuable lessons about unconditional love, forgiveness and encouragement. We are reminded that God loves us and to look past the physical and see the beauty within. "Beauty is in the eye of the beholder." I received a copy of this book from Celebrate Lit for an honest review. This is a wonderful collection of three novellas by three very talented authors. These stories give you a look at weddings from different perspectives. When I think of a wedding it's usually just about the ceremony, but as we all know it's more involved than that. We will meet a young woman who helps run a successful wedding/reception venue, a stylist, and lastly a caterer. These stories bring humor, love and romance, but they also bring a wonderful message that stayed with me even after I close This is a wonderful collection of three novellas by three very talented authors. These stories give you a look at weddings from different perspectives. When I think of a wedding it's usually just about the ceremony, but as we all know it's more involved than that. We will meet a young woman who helps run a successful wedding/reception venue, a stylist, and lastly a caterer. These stories bring humor, love and romance, but they also bring a wonderful message that stayed with me even after I closed the book. The first novella, Love at Mistletoe Inn, takes us to Idaho to the Boise Bridal Extravaganza where we meet Hope Prentiss. Hope is representing Harmony Creek which is a successful venue for weddings/receptions. She has kept a secret for 10 years and unfortunately it's one that's about to be revealed. I loved her character. In the second novella, A Brush With Love, we meet Ginger Winters who is the owner and operator of Ginger Snips, the local beauty salon. At the age of 12 life as she knew it went up in flames. The trailer fire left more scars than just the ones on her body, but they also gave her a purpose. Lastly, in Serving Up a Sweetheart, we are introduced to Meadow Larson. She and her former teacher/mentor/friend are operating Havenbrook Creative Catering out of her house. With Del out sick and a tight schedule the very last thing Meadow needs is for her roof to collapse from heavy snow, but that's exactly what happens. Each plot has good flow and pace that will keep your attention. We meet strong, well developed characters. I liked each story and loved the characters, but the one that pulled me the most was Ginger and her story. It reminded me that beauty comes from the heart. We need to take the time to see people with our hearts instead of with our brains. People are so judgmental with their eyes that they never take the time to look at a person's heart. This book brings the message of trust, love and forgiveness. I give this book 5 Stars. I would recommend this to anyone one who loves a good, clean romance that will touch your heart. Two of the authors in the books were new to me, Cheryl Wyatt and Cindy Kirk. I had already read a book by Rachel before and really enjoyed it, so I was very excited to be reading this book. I have grown to love novellas because I can usually finish each story in a days time. They are engaging and yet pretty straight to the point, not alot of unnecessary detail, and just enough to keep you interested in what is happening. I loved each story. I don't even know if I really have a favorite. They wer Two of the authors in the books were new to me, Cheryl Wyatt and Cindy Kirk. I had already read a book by Rachel before and really enjoyed it, so I was very excited to be reading this book. I have grown to love novellas because I can usually finish each story in a days time. They are engaging and yet pretty straight to the point, not alot of unnecessary detail, and just enough to keep you interested in what is happening. I loved each story. I don't even know if I really have a favorite. They were all unique in their own way. Each dealt with issues of the heart. Cindy's book dealt with childhood dis-functional family issues, the scars they leave, the need to make your life secure, mistakes of the past. All portrayed with such sweet grace. Will the couple in this book get past the family issues and be able to make things work? Rachel's book was just as admirable. Ginger, a beautician with outward scars from a fire, who cannot see herself as anything but ugly, has even deeper inner scars from lies she has believed. Once again, dis-functional family life, a small town scandal, a distorted view of God all make this book an exciting mix of emotions. Will Ginger ever see herself as God sees her, as beautiful? Unconditional love may play a part in helping her find peace. Last but not least, Cheryl's story. Cheryl addresses bullying, the scars it leaves, unforgiveness, bitterness, and the pain they inflict. Yet, God's grace is amazing and He is capable of healing all wounds no matter how deep or how long they have festered. Personally, I love plots with character and life lessons. Their words bring encouragement and healing to hurting hearts. The ones that make us look deep inside ourselves and bring out issues we may need to work on. Stories that grow us into better people. I feel like each one of these stories in this book do that! They portray Jesus as healer, redeemer, nurturer of our souls. I believe this is a book I could read more than once and would certainly recommend to my friends. Do you like Hallmark TV movies or books about weddings? I do. There's just something about wedding stories that brings out the sweetness of love. With A Season to Wed, it's not only about boy meets girl and they get married in the winter and live happily ever after. All three stories touched on realistic struggles. In Love at Mistletoe Inn, second chances and having faith for God and in each other brings about understanding between Hope and John. Verna, both of their's adoptive mother's gentle m Do you like Hallmark TV movies or books about weddings? I do. There's just something about wedding stories that brings out the sweetness of love. With A Season to Wed, it's not only about boy meets girl and they get married in the winter and live happily ever after. All three stories touched on realistic struggles. In A Brush with Love, a person's physical scars may not be the only thing hindering their chance to shine. The scars in their hearts have already built a wall of insecurities in the name of protection. Will Ginger see what others see or will she let her chance of happiness slip through her hands? I love the reference of The Proposal (movie) in this novel. Very sweet and I love that line! In Serving Up a Sweetheart, I'm reminded of how God can use what we perceive as weaknesses and humiliation for something good. Meadow's past experiences with bullying have put a cloud over her eyes on the very people that have hurt her, harboring distrust, yet allowing her heart to empathize and fill with compassion for those with similar experiences. A story of forgiveness and letting go and let God heal, completely. All three stories shared themes of love and letting go the past - whether it's insecurities, or disparaging remarks or judgmental stances from others. Finding forgiveness and faith that God have something good out of it all in store for you. I enjoyed them and because they are novellas, I'm able to enjoy each one in between full novels, and get my fix on some sweet romance. I'm already looking forward to the next collection, Toss the Bouquet (out May 2016)! This review first appeared on Just Commonly Blog. A Season to Wed contains three sweet winter love stories: Love at Mistletoe Inn by Cindy Kirk, A Brush with Love by Rachel Hauck, and Serving Up a Sweetheart by Cheryl Wyatt. Each of the stories is about recovery, redemption, and romance. The female main characters are women who all play significant parts in weddings, but always from the outside, never their own. I love reading romance collections! My favorite of the bunch was Love at Mistletoe Inn. Hope Prentiss runs Harmony Creek, a wedding venue. When she was 18, she and John Burke ran away to elope-when Hope suddenly changed her mind right after exchanging vows. Thinking the wedding wasn’t legal since the paperwork wasn’t sent in, ten years later she finds out she is still very much married to John, and has to figure out what to do about it! John has grown up since that night, but Hope still sees him as a young teen and doubts the marriage can work. But John is not about to give up on Hope! This was a genuinely sweet, heartfelt story. A Brush with Love-Ginger, a top notch beautician, has no room in her heart for loving herself or others after being horrifically burned and scarred. But when her childhood friend returns to town, he’s determined to make her see that she’s beautiful and worthy of love, in his eyes and her own. Serving Up a Sweetheart was the most emotionally charged novella of the three. Meadow, now a successful wedding caterer and designer, was once bullied in school, and, the oldest of 5, had to take care of her siblings after their abusive father got put in jail and their mother turned to drugs. When one of the bullies, Colin McGrath, turns back up in town, Meadow learns how to truly forgive, open up her heart, and see that people can change. "Love at Mistletoe Inn" by Cindy Kirk. Hope Prentiss and John Burke decide to have a quick wedding when they were 18, but when Hope her mind, they both go their separate ways and forget about the wedding, like it never happened. The years later, Hope finds out they are still married. "A Brush with Love" by Rachel Hauck Ginger Winters’s specialty is making ladies beautiful, but she will never be beautiful because of the scars she received from a fire. But when high school crush Tom Wells shows up in their little town again, he sees Ginger differently. But can Ginger accept her scars and come out of her shell? "Serving Up a Sweetheart" by Cheryl Wyatt Meadow Larson is frantic when her roof caves in during a blizzard because she is suppose to cater the biggest wedding of her career. Her new neighbor across the street Colin McGrath just happens to be a contractor and offers to do the job for her. But the two knew each other from high school, though they were anything but friends back then. Can Meadow trust the new Colin to treat her fairly in doing the work in her house? I loved all three of these stories, so I can tell you one is better than the other. All three of these author did an amazing job in capturing the lives of these three couples, and weaving together stories that will warm your heart. I love reading short stories once in a while, because I can read one story in one setting! This is a great book for those who don't have time to rad a full size book! Check out Season to Wed, and enjoy several hours of entertainment. After a slightly confusing introduction to the story and after a few pages of reading, I grasped the concept that and cute story idea of two young people, Hope and John, falling in love and having a shotgun wedding. But after being apart for ten years and believing that their marriage was not valid, when in reality it was, this changes everything. Although the storyline had great promise, I felt like the relationship between Hope and John was a bit forced. I did however enjoy the ending of the story. At age twelve Ginger Winters was in a tragic fire leaving scars on her body. Now a beautician, Ginger doesn’t know what to make of her previous high-school crush when he returns to town twelve years after not showing up their first date. Ginger is especially confused when Tom tells her she is beautiful, scars and all. Ginger and Tom’s relationship is beautiful and precious. As always, author Rachel Hauck brings life and feeling into her characters and wonderful stories. After the roof caves in on her double home and catering business, a bully from Meadow’s past comes to her aid to rebuild her home and kitchen. As a teen, Colin used bullying as a way to hide family troubles, but has always regretted hurting Meadow. Through the rush of preparing some catering events and Colin fixing up her home, can Meadow and Colin become friends and even fall in love? Cheryl Wyatt has created a sweet and tender romance in her novella. With characters that learn from the past and fall in love. This winter romance is one that readers will not want to miss. "A Season To Wed" is a collection of three winter love stories and they are all wonderful. They will cause your heart to want to fall in love again. "Love at Mistletoe Inn" by Cindy Kirk is the first story in the book and though I like the story, the book wasn't my idea of a Christian story, yes it was clean, I thought some parts might be considered a little much for a Christian romance. 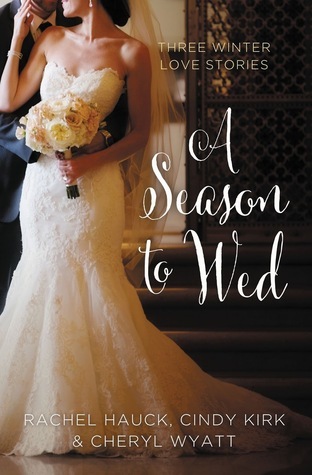 Yes, I would recommend this book and say it is a clean read but the other two stories are definitely Christia "A Season To Wed" is a collection of three winter love stories and they are all wonderful. They will cause your heart to want to fall in love again. "Love at Mistletoe Inn" by Cindy Kirk is the first story in the book and though I like the story, the book wasn't my idea of a Christian story, yes it was clean, I thought some parts might be considered a little much for a Christian romance. Yes, I would recommend this book and say it is a clean read but the other two stories are definitely Christian. "A Brush with Love" by Rachel Hauck is one story that I really really loved. I have to tell you I cried by the time I was finished with this story. No I don't have physical scars but I have emotional scars and I too have a hard time (some days) believing that God loves me, but I am going to tell myself that I am beautiful and that I am loved just like Ginger in the story. I was really convinced that my problem is like Ginger that I expect others to treat me like they do because it is how I see myself. I have put quotes from this book as my Facebook status. Yes, this story is that good. This is my Facebook status after finishing this story, Have you ever read a book that when you finish it you think God you had the author write this story just for me and it begins a personal change in your thinking about yourself and about how God loves you! I know others won't see this story the same way I did nor will it has the same impact but ""A Brush With Love" by Rachel Hauck is definitely a life changing book for me even if it is fiction. "Serving Up a Sweetheart " by Cheryl Wyatt is about a girl who was abused at home and bullied by her classmates. This story made me cry also. All three stories are about past loves and second chances. I am giving this book 4 stars. I have added all three authors to my authors I want to read more of their books list. I always enjoy a cute anthology and this collection is sweet. Each story has a woman who was shunned for one reason or another in high school. Each one grows up into a strong, successful woman, but they each still feels scars from the past and must overcome those hurts and move on. Love at Mistletoe Inn tells the story of a young couple who eloped on a whim and almost immediately regretted it. Ten years later, they find out that the marriage counts and decisions have to be made about where to go from here. I love Aunt Verna and the way she is able to connect Hope and John in subliminal ways. These characters are smart and willing to work hard for what they deem is right and necessary. A Brush with Love is a little hard to read. Ginger has very prominent physical scars that leave her very insecure. After returning back to small town, hometown Alabama, she finds herself learning secrets from the past that rock her world. I love Ginger because when life handed her lemons, she made lemonade. She's a great character! Tom has his reasons for disappearing and coming home and he's such a true and persuasive gentleman. This story wormed its way into my heart and soul. Serving Up a Sweetheart tells the story of Meadow and Colin. Colin was part of a group who tormented Meadow in school and now he's here to make amends--if she'll let him. It's usually truth to say that people grow up and change. Dumb things are regretted and people are typically treated the way they should be. I love lessons mingled in with a great story. These are each great, clean, Christian romances that are perfect for a nice winter's day--or really, anytime. “A Season to Wed” is a collection of three romantic novellas with winter settings. Each novella was penned by a different author and the plots are not related. However each book has similarities. In each story, the heroine encounters a man who meant something to her in the past but for one reason or another, their relationship ended. Each of these couples find themselves with a second chance at love. I thoroughly enjoyed each of the three stories. If romance is your genre, you won’t want to miss “A Season to Wed” is a collection of three romantic novellas with winter settings. Each novella was penned by a different author and the plots are not related. However each book has similarities. In each story, the heroine encounters a man who meant something to her in the past but for one reason or another, their relationship ended. Each of these couples find themselves with a second chance at love. I thoroughly enjoyed each of the three stories. If romance is your genre, you won’t want to miss this collection. Love at Mistletoe Inn by Cindy Kirk is a special tale of a couple who ran away to get married at the end of high school but changed their minds after the ceremony. After believing she was not married for ten years, Hope learns that her marriage was indeed legal. To her surprise, her husband John Burke chooses that exact day to reappear in her life. Naturally things will work out for the best, but what fun reading about how it happens! Serving Up a Sweetheart by Cheryl Wyatt was another excellent story. Once again, the primary characters have a history but the last thing Meadow wants is to reconnect with Colin. She has little choice when her roof caves in during a snowstorm and there is no other contractor who can repair it in time for her to meet her catering deadlines. As Colin goes out of his way to make things easy for Heather, she realizes that he is not the same person she remembers and her heart begins to soften toward him. Not until her daughter was heading off to college did Cindy return to her first love---writing. Unlike some writers, Cindy wasn’t interested in newspaper or magazine articles, short stories or poetry. When she decided to start writing, she jumped feet first into book length fiction. She loves reading and writing romance because she believes in the power of love and in happily ever after. An incurable romantic, Cindy loves seeing her characters grow and learn from their mistakes and, in the process, achieve a happy ending. She and her high school sweetheart husband live on an acreage with two cats…one of whom loves to sit next to the computer and supervise her writing.